Welcome to a new year! To start the year off right (and to help you join in on our #3BforHealth contest! 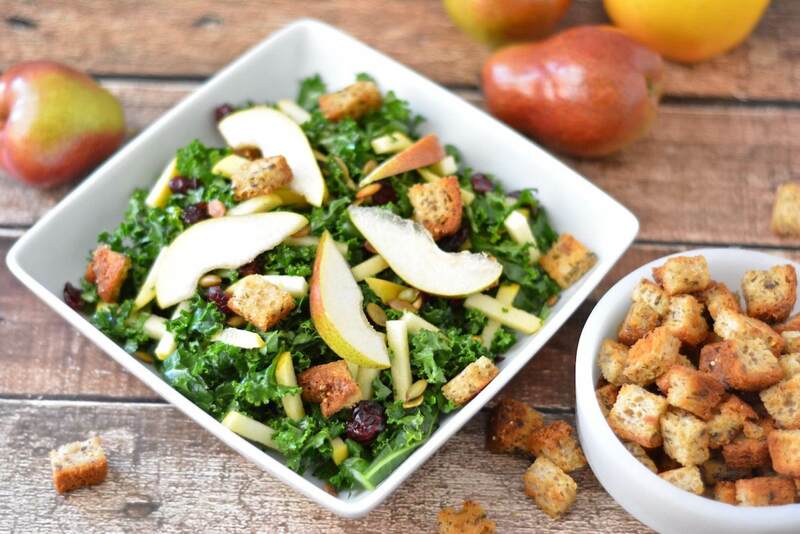 ), enjoy this tasty winter salad filled with hearty greens, sweet fruits and crispy homemade croutons. Making homemade croutons is so easy and only takes a few minutes, elevating any salad to new heights. Using Three Bakers gluten free Whole Grain Bread to make your croutons gives the added bonus of additional fiber and all the nutritional benefits you find in amaranth, hemp, quinoa, teff, sorghum, flax and millet. All that, and it’s delicious, too! Whisk together olive oil and Italian seasoning. Season with salt and pepper. Toss bread cubes until cubes are evenly coated with oil. Spread seasoned bread cubes on a baking sheet and bake for 15 minutes in a preheated oven. Stir bread cubes every 5 minutes while baking. Croutons are done when golden and toasted. Allow croutons to cool before adding to salad. Remove the kale leaves from their stems. Thinly slice leaves. Place in a large bowl with apple sticks. Drizzle with vinaigrette and toss until coated with dressing. Divide kale mixture on four plates. Top salads with pear slices, cranberries, pepitas and croutons.